These are some testimonials of just a few of our many satisfied customers. At Straight A Builders your satisfaction is our main goal! 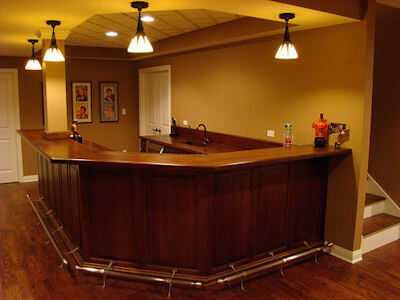 "Just had a complete basement remodel done by Trent. We couldn't be happier with the work that was done. From start to finish we received 100% professionalism from Trent and his workers. Trent was extremely respectful and honest. We will definitely be using Trent and Straight A Builders again in the future. If you're trying to decide between which company to go with, it is not even up for question, your choice should be Trent and Straight A Builders. Very grateful, the L------ family :)"
-- Joe, Kelly and Barb L.
"I have been 100% satisfied with all the jobs that I have hired Straight A to complete for me. The professionalism and ethical way in which my job was treated only leaves me looking for more work to be done! My kitchen is admired by all who enter my home. I am thankful for the providential path that led me initially to Trent and his band of men, and have not hesitated to recommend him to many people. ". "For years I planned and waited for the right time to add a combination screened-in porch/deck area to the back of my house. I interviewed several construction companies and independent carpenters before deciding on Straight A Builders, Inc. I could not have made a better decision. The planning started with Len DeYoung who met with me several times discussing the project then finalizing the plans with a computer sketch for me to view. From beginning to end of construction both Len and/or Trent VanderZee were on the job site watching over the various phases of construction for precise measurements and accuracy to the plans. I was very impressed with their attention to detail and with the solid construction of the addition to my house. In addition to being skilled carpenters, both were gentlemen to work with showing patience with my impromptu changes to the plans. My neighbors confirmed my opinion of their work by sharing complements with me on the final product. I would not hesitate to recommend Straight A Builders to my family or friends." "We chose Straight A Builders as General Contractor for our new home because we felt we could trust Trent's advice and professionalism. We had never built a home before, let alone a custom home, and we knew that we would need expert help in the decisions we needed to make. Trent helped steer us through the entire process, and we are thrilled with the end result. If we were ever to consider moving, we would definitely build again and use Straight A Builders as General." -- Terry and Beth H.
"I first met Trent through a common friend who was building a home using Trent as the General Contractor. Trent came along when the owner interviewed me to be a subcontractor for his job. Trent was very interested in making sure that all the subcontractors were quality. When I saw the quality of Trent's workmanship, I knew there was not another that equaled his quality. I have been in the trades for over 30 years, and there is no doubt who to call when I need work done. I have recommended Straight A to many folks, and all have been elated with the results. Trent goes over and above the call of duty! 'Trent and Straight A Builders, it's a no brainer!" "We were very comfortable working with Straight A Builders. They very willing to work to our needs and didn't pressure us into anything. While the job was in progress we found that the guys at Straight A were very respectful of our home and our belongings . The end result was a job done quickly and well , at a fair price. We will definitely work with Trent and his guys in the future. " "We had Straight A Builders complete the trim carpentry and install our cabinetry in our offices. The craftsmanship demonstrated by Trent and his team are excellent. They gave our modestly priced conference room cabinets the look of high end custom cabinetry. Great people and great value." "One of the things that expresses the difference in construction by Trent is the quality of the work. When the City Inspector came in for the rough inspection he remarked how well things had been done. His former job? Carpenter. That tells you the quality of Trent's work. I also knew he was honest all the way from contract to invoicing. Thanks Trent. ". "We appreciated the the great customer service and attention to detail provided by Trent. The quality of construction is excellent and everything was completed on time and under budget. We will definitely go to Straight A Builders with any future construction needs." -- Dave and Allison V.
"Trent, Jenn and I cannot thank you enough for the great work you did with the addition, deck and moreover our basement. We are extremely satisfied with the work you have done and only wish you built our entire house! Your attention to detail, quality and ease of communicating are the number one reason we will continue to work with you on future projects. We would be happy to be a reference in the event you ever need us. Thanks again for all your work and effort you put in on our two projects." -- James & Jenn C.
"I hired Straight A Builders after seeing their work done at my neighbor's home. It was one of the best decisions I made regarding construction of my new home! Trent's vision of my multi-level custom deck with attached gazebo was the finishing touch needed. Trent is a pleasure to work with, trustworthy and a great professional." "The quality of Straight A Builders work and attention to detail are what make Trent my obvious choice for a contractor. Trent's commitment to excellence in his trade is evident long after the work was completed on our home. The excellence of Trent's trim carpentry skills continues to be evident in our home. Trentʼs commitments to quality and customer satisfaction are genuine and proven over and over in the work that he has done for us." -- John and June K.
"Great work! Great service! Good quality, attention to detail, trustworthy and very efficient! What more can you want?" "What I liked most was the help I got in designing our deck. Being able to see a 3-D image of what the deck will look like when completed helps tremendously! What a great job they do!" Are you a customer or have worked along side Straight A Builders and would like to leave a testimonial? Please send it here. Straight A Builders, Inc. is a northwest Indiana general contractor and subcontractor. We specialize in building new custom homes, general contracting, remodeling, bathroom remodeling, kitchen remodeling, major renovations, home improvements, commercial build outs, steel studs, drop ceilings, millwork installations, insurance repairs, basement finishing, additions, bonus rooms, sunrooms, decks, trim work, finish carpentry, cedar siding, soffit, window replacement, garages, and more. We are Lake County Northwest Indiana based builders servicing, but not limited to, Crown Point, St. John, Schererville, Cedar Lake, Dyer, Munster, Lowell, Merrillville, Hobart, Highland, Hammond. Please call for a free estimate: 219-661-9124.